Let’s see what the differences are. Vinyl swimming pools are less expensive than concrete swimming pools. As the name indicates, they have a vinyl liner on the interior rather than concrete. Years ago you could definitely tell the difference in swimming pool types since the liner pools had a plastic coping all along the edge. Generally speaking, you can plan on saving about $15,000 to $20,000 if you were to select a vinyl liner pool rather than a concrete pool. While concrete pools do have some standard shapes, they can easily be customized. Vinyl liner pools come in certain standard shapes. It is not the norm to modify vinyl pool shapes, but it can be done for an additional cost. 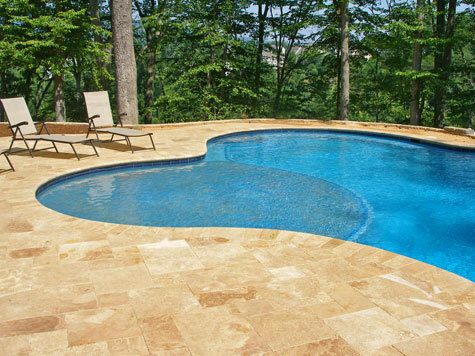 By customizing a vinyl pool, it will still be less expensive than a concrete pool. Concrete pool shapes can be completely customized. 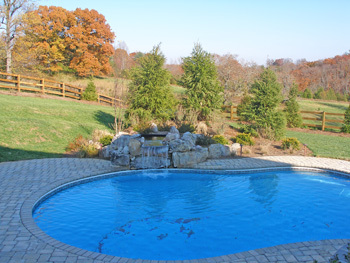 Today, you can install beautiful copings with a liner pool. Actually, you can use the same copings that are often used in concrete pools. The coping is the material adjacent to the pool edge. 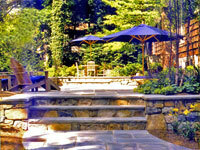 It can be brick, natural stone such as bluestone, travertine pavers, concrete pavers, or concrete. 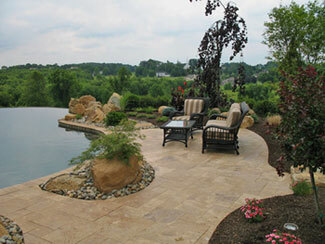 The balance of the pool paving can be the same material or it can be different. If your pool paving is concrete, and you use the same concrete coping, there are two different ways that the coping can be designed. It can be separate from the rest of the paving, where there is a joint that actually separates the two. You can run the concrete in one piece right up to the water’s edge to create a cantilevered coping. I prefer this look, although some pool contractors feel more comfortable, construction-wise, with the separating joint. Pool liners in vinyl swimming pools of today normally come with a guarantee for many years. However, worst case scenario, is that over time it will have to be replaced. It is relatively easy to have done, but there is a cost involved. There is a very wide selection of liners, and some are quite nice. That being said, you will not have this issue with a concrete pool. Both swimming pool types can have interior steps. In concrete swimming pools, they are always on the inside, and therefore the shape of the pool is continuous and not broken up. The steps of a vinyl liner pool are usually on the outside of the pool, but you can request that the steps be built on the inside. 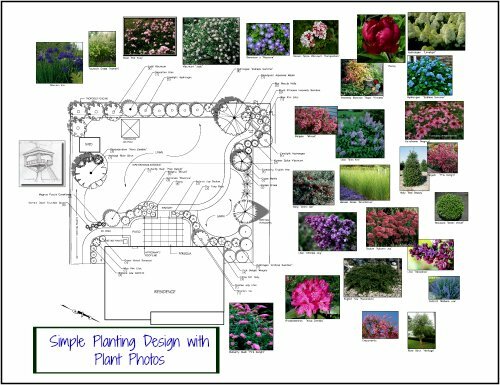 This will add an additional cost onto the project. If you would like a pool waterfall as part of your pool design, it can certainly be done with liner pools. It may be built a little differently, but nevertheless, you can still get a great looking water feature. So don't let this deter you when making your choice of swimming pool types. You would never know that this design is a vinyl pool as the waterfall is so natural looking. Sometimes swimming pools can be built where the back wall is built up higher so that it can double as a retaining wall. This can be part of the swimming pool design when there is a higher elevation behind the pool. See a video of this inground pool design with this type of wall. By the way, a waterfall elevated above a raised wall becomes very dramatic! Instead of just building the pool, and then creating a retaining wall behind it, the retaining wall becomes part of the pool’s structure. This can’t be done with a vinyl liner pool. However, you can build this wall directly behind the pool edge…very close, so that you get a similar effect. Vanishing Edge - see one of my favorite swimming pool designs! When considering both swimming pool types, if these concrete pool features are not important to you, go with the vinyl liner pool and save yourself some money.